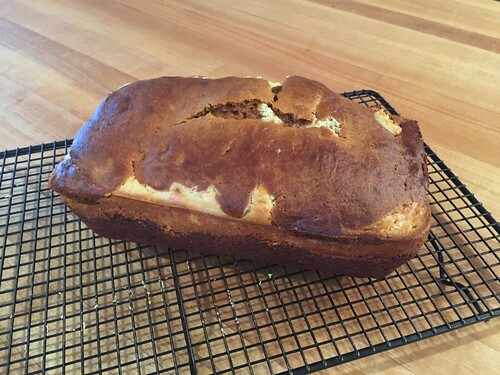 I try to share a couple new pumpkin recipes every year, and this one is one of my favorites as it combines 2 of my most favorites desserts — cheesecake and pumpkin pie — into one deliciously huge loaf of quick bread. And yes, it IS a BIG loaf! 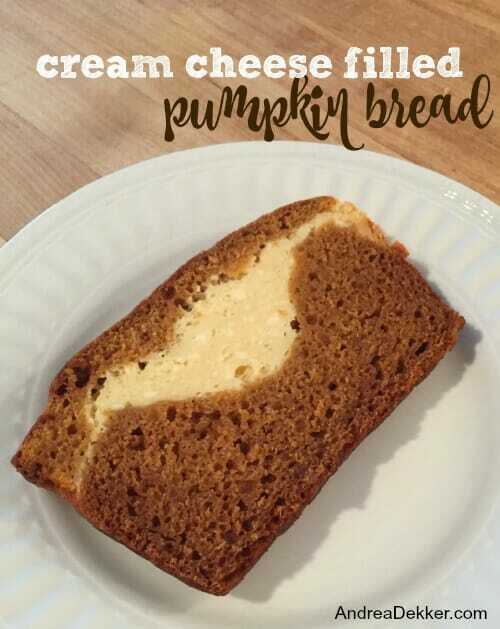 This is a fairly straight-forward recipe with “normal” ingredients, and it looks really nice in thick slices on a plate because you can clearly see the different layers of pumpkin and cream cheese. 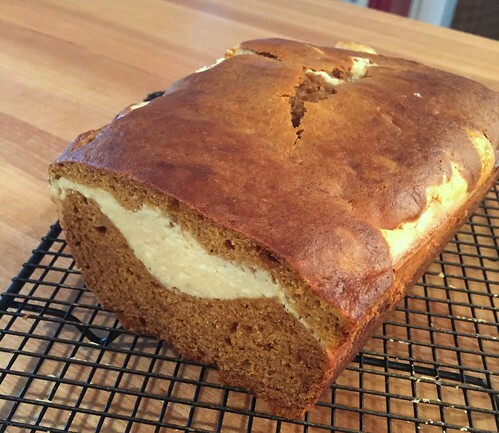 If you love cheesecake and pumpkin pie as much as I do (or if you simply want your kitchen to smell like the holiday season and have a nice gift for a friend or neighbor) this cream cheese filled pumpkin bread should be on your next to-bake list! 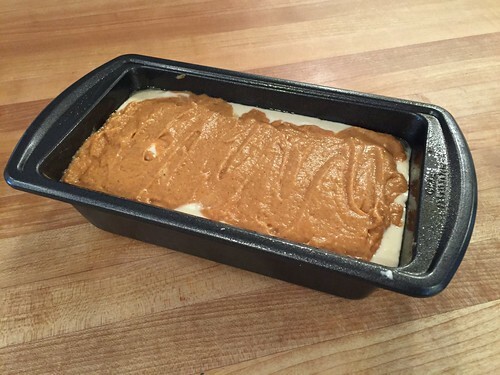 Preheat the oven to 325º F. Grease a 9″ bread loaf pan and set aside. In a large bowl, combine pumpkin, applesauce, sour cream, sugars, and eggs with an electric mixer. Add flour, baking soda, salt, and spices. Mix until combined and set aside. 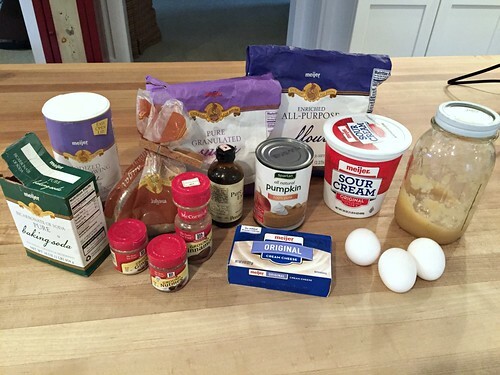 In a medium bowl, combine cream cheese, sugar, flour, egg, and vanilla until smooth. Set aside. 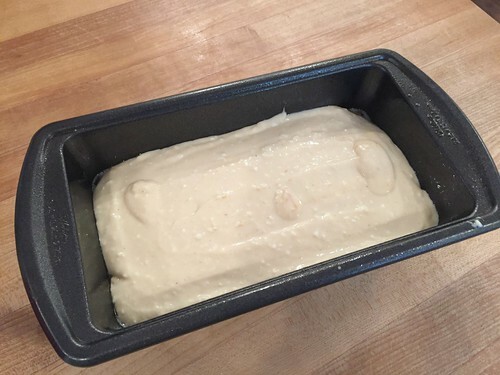 Pour a little more than half of the bread batter into prepared loaf pan. Spoon all of the cream cheese into the pan and spread evenly. Pour remaining bread batter over cream cheese layer. Bake in preheated oven for 65 to 75 minutes, or until a toothpick comes out clean. (Sometimes I put aluminum foil over the bread for the last 20 minutes if I don’t want the top to get too brown. 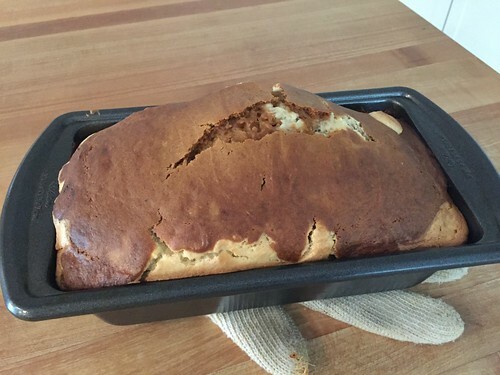 Cool in pan for 10 minutes, then cool completely on a wire rack. 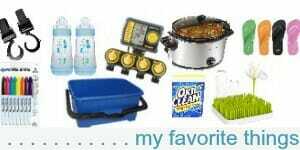 Refrigerate bread in an airtight food storage container after it has cooled completely. This recipe could also work as more of a brownie/cake if you poured all the pumpkin mixture into a 9″ x 9″ pan, then dolloped the cream cheese mixture on top, and use a knife to swirl it around. Of course, you’d want to reduce the baking time to roughly 35-40 minutes (depending on your oven). A roundup of more than 50 delicious pumpkin recipes! Made this yesterday- it was yummy! 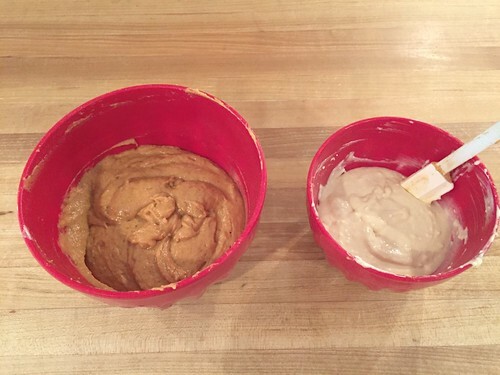 yes, I’ve made pumpkin pie spice before too — thanks for posting the recipe though! Oh my goodness this looks so good! 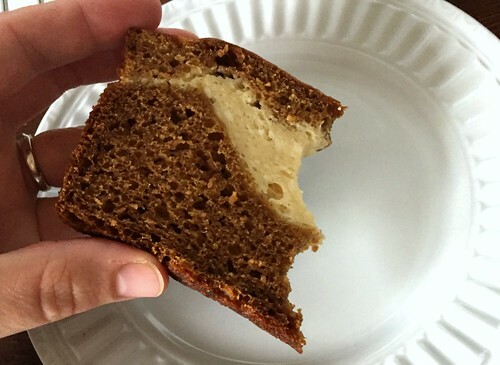 I wanted to share something I recently saw on a food blog about canned pumpkin. Libby’s brand is the only one that is pure pumpkin. Other brands contain a mixture of squashes. I’ve cooked an puréed it from scratch but in my area, sugar pumpkins cost a fortune. Fortunately I can get Libby’s at a chain grocery store. Can’t wait to try this recipe. I rarely eat wheat and very little sugar so it will be a super portable treat for our Thanksgiving camping trip. I have two bread pans so I’m going to double up and have a loaf to freeze. Thanks! I can’t wait to try this one! 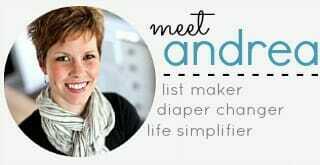 Thank you Andrea! Your timing is impeccable! I have a huge bowl of pumpkin puree in my fridge right now and this recipe is so definitely going to get a try this afternoon. Your recipes have never let me down yet. Hope you love this bread!! No because it just makes one loaf, so we can easily eat it relatively quickly. That said, I do store it in the refrigerator (because of the cream cheese) so I think that prolongs the shelf life quite a bit. If I were going to freeze it, I would probably cut it into slices before freezing.